There are a number of rare and exotic plants and animals used in the tradition of Chinese medicine. As time has gone by, stringent importing guidelines and FDA restrictions have made the trade of such items less common. From snakes and scorpions to beautiful sea creatures, there are a variety of these higher echelon "herbs." This article is the first installment in a series that will give a glimpse in to the world of the rare and exotic, their use, substitutions, and various species. First, it is germane to cover some important aspects of why snakes are used. Snakes are generally seen as wind-damp herbs that open the channels and affect the skin (of which effective remedies such as Tri-Snake Powder are based). They range from strong to very strong and are quite useful for dealing with Bi syndrome and painful arthritic conditions. They open the channels, generally relax the fascia, and can strongly penetrate wind-damp obstructing the channels to alleviate pain and stiffness. Some varieties of snakes are also used in external training liniments found in martial arts practice. These liniments are used to deter the effects of arthritis and joint injury when conditioning the hands for striking. This correlates directly to the more clinical use described above. These 4 snakes are used with several different Chinese "herb" names and generally substituted for each other across the board in a few different ways. All of these snakes are considered first and foremost Wind-Damp herbs and all are used to open the channels and treat Bi syndrome. They are all also gutted and dried prior to use when in their whole state. Bai Hua She is the most common term that you hear for the toxic version of snake that is used. This sweet and salty animal is venomous and is seen as a toxic and warm herb, so should be used with great care. Chen & Chen notes the dosage as 3-10 grams, or up to 1.5 grams when ground. While these are the recommended dosages, I´ve seen it used in larger quantities for 1-gallon batches of medicinal wine. It is this species that is most commonly present in the strong martial arts training liniments that are applied externally. While most people connect Bai Hua She with the Pit Viper or a couple delineations of Agkistrodon (genus), Bai Hue She is technically and correctly, the Bungarus multicinctus or Bungarus parvus; these animals have a very toxic bite and are known as the Sea Krait, a member of the Elapid family of which the Cobra, corral snake, and Black mamba also belong. This snake has a blackish body with an iridescence that produces some rainbow-like coloration and white or yellow bands throughout the body. It is a long and thin snake with a long and thin head--this is important for differentiating dried specimens: the head is long and flat, with very little shape or curvature and the body is long and thin. Bai Hua She seems to be the more common variety around currently, and it doesn´t seem uncommon for merchants in China to sell snake advertised as a Viper but is in actuality selling a Sea Krait. Bai Hua She (namely, the family of Elapids, and more specifically any of the Bungarus genus) venom is a mix of very powerful chemicals; much stronger than that of its cousin, the Cobra. Per unit volume, its toxicity is on the scale of magnitudes more powerful than the Cobra. It is composed of a battery of toxins called bungarotoxins, among other things. These are neurotoxins that generally work by blocking receptors in the brain so that neurotransmitters are unable to bind to the receptors. In other cases, the venom produces neural over-firing and eventually exhausts the store of neutrotransmitters within the synaptic gap. The end result of many of deaths from these bites is because the diaphragm can no longer flex to produce a vacuum in order to allow the lungs to breathe–in essence, one relaxes to death. This correlates quite closely to the Chinese medical action of relaxing tension. It comes as no surprise that these species enter the Liver meridians. The group of "bungarotoxins" shows up in all of the Kraits that belong to the Krait family and so any of these 5 or 6 species would be a perfect substitution. It is even likely that various Kraits are used and we may not ever be able to tell the difference–as long as it´s a Bungarus Krait, we have a near-identical match. However, we could go as far as to say that any Elapid, including Cobras (you can actually buy Cobra wine in China and Vietnam), would be a suitable snake to use under the name Bai Hua She with similar to identical results. Based on various conversations over the years, Qi She tends to be the more accepted name for the true Pit Viper, which was probably more common in the past. True Pit Vipers are a sub-family of the Viperidae family of snakes. Viperidae is a class of snakes that includes all Vipers, from Vipers that have no pits to true Pit Vipers, as well as the small group of Night Adders. Pit Viper venom is largely focused on physical destruction of the victim. 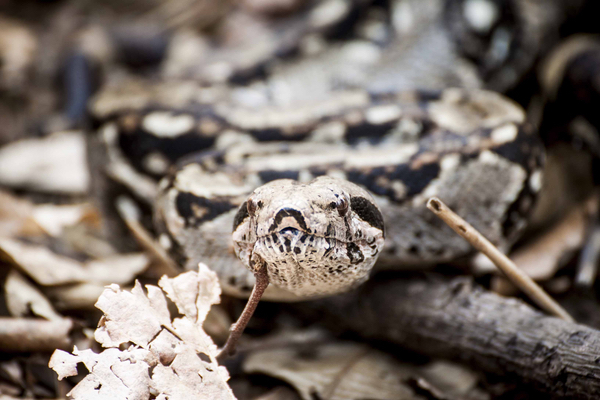 Where Elapid bites may not be extremely painful, Viper bites are very painful and can cause destructive consequences such as tissue damage to bite victims if aid is not immediately available. Many of the toxins also alter the body´s thrombin response to cause a variety of problems such as hemorrhaging and blood coagulation issues--interestingly, San Qi (Pseudoginseng) lowers the prothrombin time for the body to help stop bleeding. So, we can see these Pit Viper venoms do not generally contain the neurotoxins that are commonplace in the Elapids above–the venoms from these 2 groups of snakes work in entirely different ways. Nevertheless, they tend to produce the same medicinal effect when the entire animal is used. Within the realm of true Pit Vipers, there are many dozens of species. The one most commonly used in Chinese herbalism come from the genus Agkistrodon, which is commonly knows as...Copperheads! Also known as the Moccasin, these animals have absolutely stunning designs and are not uncommon in the Eastern part of the United States. The Agkistrodon acutus (formally classified as Deinagkistrodon) is perhaps the most well known, often times called the "one hundred Pace Viper." Additionally, the Agkistrodon contortix and Piscivorus are snakes that would easily fit in to recipes identically. While the above are the three recognized species (and particularly, Acutus) that are used for Qi She, there are a whole myriad of Pit Vipers that have many of the same characteristics as these; while its relatively unclear as to whether anyone uses them as substitutions, there is a fair deal of confidence that almost all of them would produce the exact same results in a formula. Among the overarching group of true Pit Vipers, you may be familiar with some of the common names: Mocassins, Cottonmouths, Lance Heads, Bushmasters, Horned Vipers, and...Rattlesnakes! The Wu Shao She, or Black Striped snake, is cooler in nature than Bai Hua She; it is a non venomous snake that is used when the strength of venomous species are not needed–we should always seek to use the least dangerous substances we can to suit the required use, especially for internal use. Only the most dire of situations call for the venomous snakes mentioned above, making Wu Shao She much more suitable for most clinical settings. Additionally, Wu Shao She is also substantially less expensive than the venomous options and available in granule form, so this is a consideration as well. Wu Shao She is more common and is often seen at half the cost or less of Bai Hua She in China. In contrast to Bai Hua She above, this non-venomous animal is used in dosages of 5-10 grams and up to 2 grams when ground. From this we can see that the general consensus is that Bai Hua She is approximately twice as strong as Wu Shao She, and thus used in half the dose. Wu Shao She is generally the species Zaocys dhumandes or Rat snake. The rat snake is a colubrid and thus belongs to one of the largest groups of snakes on the planet. It shares common classification traits with snakes like the corn snake and king snake. Furthermore, the Elapids discussed above are part of a sub group of colubrids and so share a vague relation to the group of snakes one would use as Wu Shao She–essentially, they lack the venom that most Elapids have and this seems to produce a medicinal physiology that differs significantly from venomous animals. FUN FACT: King Snakes are not venomous themselves. But they are colubrids related to the Rat Snake, which are immune to the venom of other snakes in their habitat. They have been known to eat Diamondbacks! The Eastern world has had a great fascination with snakes of all kinds, from peasants and farmers to royalty, and everyone in between; this includes martial artists who have been incorporating freshly caught snakes into their formulas for who knows how long. Some cultures drink snake blood while others actually drink the venom as a shot (I have never actually seen it, but heard stories about how one swallows a capsule following the venom to reverse the effects of the venom as it is digested. It is not as harmful when taken in this form rather than being injected into the blood stream, but still harmful.) Others have harvested snake bile and gall to be used for various reasons, and the meat of rattlesnake has been a fanciful dish–even a delicacy–across the world. In more recent times, the Chinese had begun to migrate over to the United States for a variety of reasons. The railroads were being built and America was seen as a land of opportunity. Peoples from many countries were doing anything they could to leave the dilapidated living situations from which they originated to seek fortune and worth in the States. Upon arrival here, the Anglo-Chinese population began to take hold. Traditional herbs were difficult to procure, and new substitutes had to be made. New strains of Bo He, hot peppers, and herbs that augment the function of San Qi come to mind. While the shipment of various snakes from China began to take place, the Chinese also began to use other types of indigenous snakes in place of the Pit Viper mentioned above. In the last 30 years, rattlesnakes were commonly used and in recent times they are actually sometimes preferred by some herbalists here in the states. They are very close in potency as a medicinal, if maybe the slightest bit less potent...certainly nothing noticeable. Among the commonly utilized rattlesnakes Diamondbacks top the list, of which I have had the rare opportunity of using freshly caught and gutted. They are large robust snakes, true pit Vipers, and one of the more common catches in certain parts of the US. Additionally, copperheads are quite common pests to be caught, especially in the Eastern portion of the states, common around sources of heat such as air conditioning units, pool pumps, and heated garages. Today, these 2 are the top choices when snakes or granules are in low supply on the US market. She Tui is the sloughed skin of a snake. This is more humane because it does not require the death of an animal, but it is also quite easy to simply collect snake skins and sanitize them for use in herbal formulas. It is also available as a granule. While this particular "herb" does not work as strongly or deeply on the body as the entire animal, it is a cost-effective and suitable substitution to make. It will work effectively for all but the most serious ailments and is usually used in 3 gram quantities in decoction. As we move forward in our herbal endeavours, we should always seek to find good substitutions that solve the problems at hand. As time moves on and the stronger more venomous snakes become more difficult to procure, we can look back at our history and smile in satisfaction, knowing that we have been privy to this old historical look, and feel confident to be a part of the evolution of a more modern era. Vitt, Laurie J., and Caldwell, Janalee P. "Herpetology, Third Edition: An Introductory Biology of Amphibians and Reptiles". Academic Press, 3rd Edition, 2008.